DVD Review: "Monty Python Live (Mostly): One Down, Five to Go"
The executive summary for this review is: if you have a Monty Python fan on your holiday shopping list, the DVD of their recent, purportedly final performance from the summer of 2014, Monty Python Live (Mostly): One Down, Five to Go, is a must-have, providing he hasn’t bought it for himself already. Don’t start typing angry responses to the choice of pronouns: you know as well as I do that, for some reason, the humor of the Pythons is particularly guy-centric. Like fans of bands that have audiences comprised of 90% males and 10% of whoever they have coerced/bribed/browbeaten, there is a specific audience for this comedy troupe, and a loyal audience it is. Therein lies the problem. The setlist for this performance is nothing but the classic sketches, with a surprise here and there, adapted for the 21st century as a musical revue most of the time. There’s nothing wrong with that, and it is a thrill to see Eric Idle, Terry Jones, Michael Palin, Terry Gilliam, and John Cleese performing them again. That was what made the digital theater simulcast so special, being a communal experience between the many Knights of Ni. However, when you bring it home on disc, you’re likely going to place it on a shelf of honor next to all the other Python DVDs with all these sketches performed at the peak of the team’s powers. Overall there are improvements to the DVD that were troublesome during the live telecast. Cameras were in the wrong place at the wrong time, and big moments were lost in the melee on occasion. Thanks to the wonders of technology, where digital feeds from multiple cameras can all be recorded so all information is available to editors, a lot of that chaos has been diminished. Not always. The opening “Llama” sketch, which relies heavily on absurd English subtitles to get the joke that the team are saying in Spanish on stage, is still botched. The subtitles are on the big screen above the performers’ heads, but the cameras are all on the individuals. What we derive from this are a bunch of silly British (and one American) men speaking Spanish. The diehards know the bit already and are entranced by the fact that the Pythons are doing it. For anyone else, you might wonder why anyone was laughing. Now, having said all these nasty things, I will now contradict myself and say how thrilled I was and am still that the team went ahead and did this. I’m glad that it has been made available to audiences via DVD and Blu-ray. I’m proud to put it on my own Python shelf. It is more from a perspective of watching an assembly of people who are pioneers of a specific craft — the writing and performing of a sketch. Sketch comedy today is at the lowest point it has ever been at. That’s partially due to the standards of comedy found on YouTube, where a kick in the crotch can gain a million views, or because of reality TV where the Housewives Of The Seventh Ring Of Hell elicit laughs just from how pathetic and clueless they are. It’s not an art, it’s an aftermath. And when we talk about Saturday Night Live lately, it is about the failures to be funny versus the new characters that become emblems in pop culture. 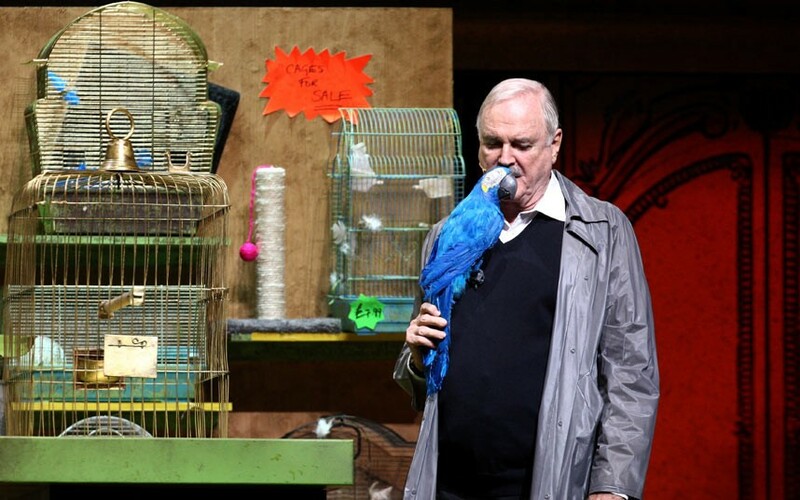 Witnessing Monty Python doing what they do is endearing and somewhat sentimental. They broke so many boundaries, following generations chose not to break any boundaries at all, out of either deference or laziness. Blah, blah, blah. 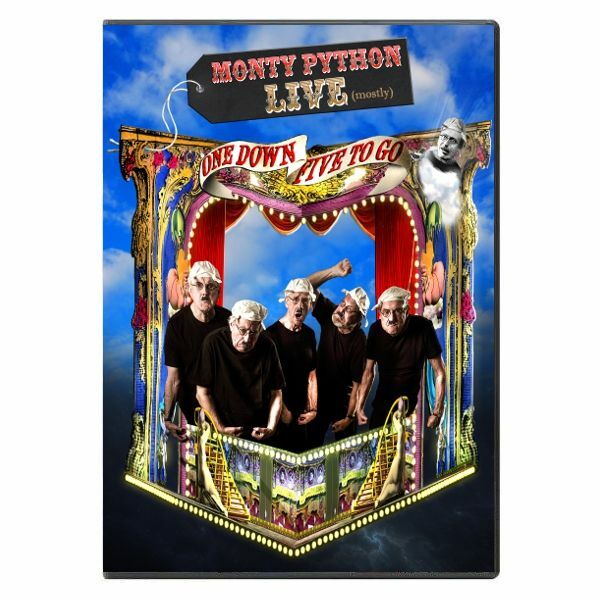 If you love Monty Python, you’ll want Monty Python Live (Mostly): One Down, Five to Go, even if you don’t go back to it as often as Life of Brian or The Holy Grail. If you don’t love Monty Python, you’ll be as perplexed now by the fan worship as you were. If you only enjoy goofy cat videos, then none of us can help you anymore.